Samson Expedition Escape 6" Portable Rechargeable Active Bluetooth PA DJ Speaker. All-in-one portable speaker system that weighs 8.5lb. Internal rechargeable battery for 20 hours of continuous use. Bluetooth connectivity to wirelessly stream music. 2-way speaker enclosure with 6" woofer. 1" high frequency driver. 2-channel mixer. 1/4" input for microphones and other line level devices. 1/8" stereo Aux input for stereo line level devices. Rockville RWF20 Handheld UHF Wireless Microphone System, Battery Powered Receiver, and Mic. 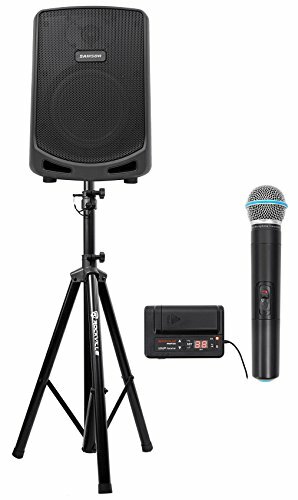 Battery powered receiver and microphone means you can use the system with no power outlet! It is 100% battery powered. On the go system is compact and can fit in your pocket. 100 Switchable frequencies ranging from 614MHz--698MHz. 10 systems can be used at the same time. Can be connected to a powered speaker, mixer, amplifier, home theater system, etc..
IR scanning button to automatically pair receiver and microphone after changing channels. Up to 200 foot range for total wireless freedom. Up to 8 hours of continuous use from 2 AA batteries. Ergonomic microphone constructed with 70 % plastic and 30 % metal. 24-bit / 48KHz digital technology for incredibly accurate sound. 20 Hz--20 kHz frequency range with flat response. High sensitivity, unidirectional, wireless cardioid microphones. Adjustable gain adjustments optimized for any input source. Frequency and power lockout technology means when you are locked into a frequency. The system will not allow anything on a similar frequency to interfere.